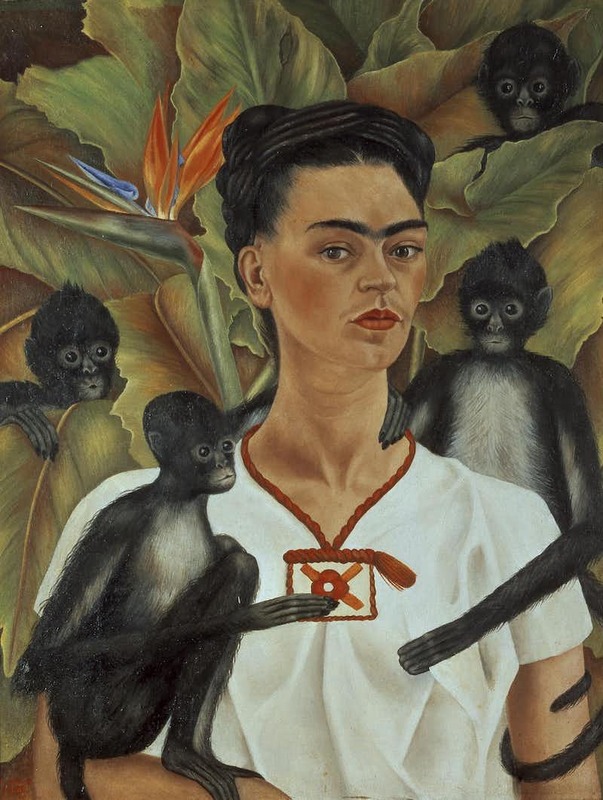 Frida painted a few self-portraits which include her monkeys and this is one of them. This painting was painted in early 1940s and that was her most prolific years with several self-portraits painted during that period. In this self-portrait the background is a tropic plant and which is a common theme Frida liked to use. She posed herself in an academic setting. At that time Frida started to work as a teacher at School of Painting and Sculpture in Mexico City. But not long after she started her teaching, her health condition got worsened and she had to hold the classes in her own house. Eventually the class was downsized to only four loyal students. They call themselves "Los Fridos", which means they are loyal to Frida Kahlo. Here Frida painted herself surrounded by four monkeys and which may implied her four loyal students.